Reading, UK, 2 December 2015 – Despite record UK sales of £1.1 billion on Black Friday, British consumers are much less satisfied with retail customer service compared to Christmas 2014. 21% of consumers complained that it was impossible or extremely difficult to find information on retailers’ websites, a threefold increase from 2014’s 7%. This is according to new research from multichannel customer engagement software provider Eptica. Released today, the 2015 Eptica Retail Black Friday Customer Experience Study surveyed the customer experience around festive shopping, particularly Black Friday and Cyber Monday, in both the UK and United States. It found that American shoppers were marginally less happy with service levels than their British counterparts, highlighting widespread dissatisfaction with the customer experience on both sides of the Atlantic. One third (33%) of British consumers and 35% of those in the US are unhappy with the online experience, a figure that rises to 37% for shops in the UK, and 40% in the US. In the UK many are also leaving their Christmas shopping until after the Black Friday/Cyber Monday rush. While 24% bought items online on Black Friday and 12% on Cyber Monday, 49% hadn’t made any purchases before the end of November. 17% had bought items in store on Black Friday, while 63% had not yet made any purchases on the High Street at all. In fact, a fifth (20%) said they hadn’t yet started their festive shopping at all, with a further 13% completing under a quarter of their intended purchases. 9% of organised UK respondents had finished shopping, with another 29% having completed over three quarters. This demonstrates that retailers need to ensure that they have the resources and technology in place to deliver fast, accurate service throughout the Christmas season, rather than just around Black Friday. A significant minority of consumers are also using their smartphones to buy when they are in store. 14% bought from the website of the retailer they were in but 13% purchased instead from a rival. This lags behind US figures of 23% and 20% respectively but, given US trends normally spread across the Atlantic, it highlights what may happen at Christmas 2016 in the UK. Clearly companies need to work on their mobile customer service, with over half of those that bought in store via smartphones complaining about the service – 57% in the case of those purchasing from the retailer they were in, and 53% if buying from another company. This shows the importance being able to provide the right information at the right time to customers to help them move swiftly through the purchasing process, whatever channel they are using. 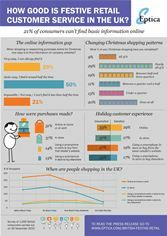 The 2015 Eptica Retail Christmas Customer Experience Study is based on consumer research conducted by Toluna with 1,000 UK shoppers and 1,000 American shoppers on 30 November 2015. The Eptica customer engagement platform is designed around a central knowledge base, powerful workflow and Eptica Linguistic Services™, advanced linguistic capabilities that enable organisations to quickly understand the tone, sentiment and context of digital interactions and automatically deliver personalised service. Today, more than 400 organisations across all industries and in 15 countries rely on the power of Eptica’s platform. They include AXA, Dixons Carphone, Domestic & General, AirAsia, Hastings Direct, L’Occitane, TUI, Debenhams, Capita and Ageas Insurance Solutions. Eptica’s continuing innovation and strong performance has resulted in the company’s inclusion in Gartner Magic Quadrants for the last five years. In 2015 it was included in the Magic Quadrant for the CRM Customer Engagement Center, for the second consecutive year. For more information visit http://www.eptica.com/, connect with us on LinkedIn, follow us on Twitter, Facebook or read our blog.